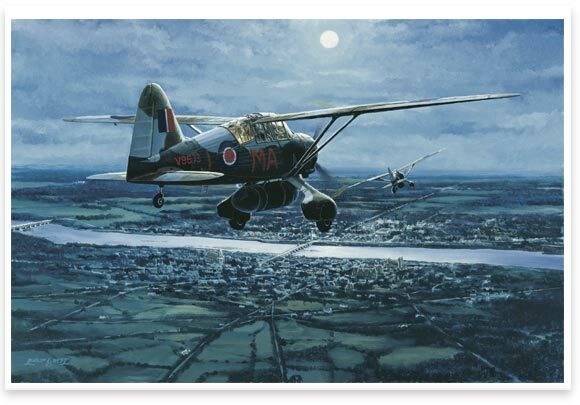 Overall size of prints 28" x 20"
Lysanders of 161 Special Operations Squadron turn onto their final course to a clandestine landing field somewhere in central occupied France during a full moon period in 1943. Based at Tempsford, Bedfordshire and often operating from Tangmere to shorten the flight, the pilots flew a dead reckoning course to their first turning point, usually on the River Loire, using rudimentary navigating equipment. The moonlit town of Blois is easily distinguishable by its chateau, churches and bridge with the Forest of Chambord beyond. The agents in the rear cockpit prepare themselves by torchlight for the forthcoming landing. The commemorative remarque is signed by the pilots, Secret Agents and 161 Sqn. members.